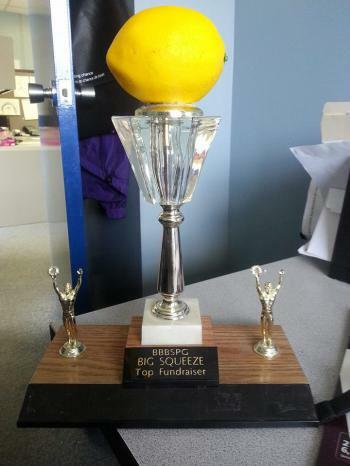 CONGRATULATIONS TO EVERYONE INVOLVED FOR WINNING THE LEMON TROPHY IN THE BIG BROTHERS/BIG SISTERS OF PRINCE GEORGE, “BIG SQUEEZE!” We raised $1110.21. almost HALF of the total; $2600!!! Thanks again everyone!!! CAN’T WAIT FOR THE 2nd ANNUAL!